Peterhof Palace, Russia Empress Maria Feodorovna from Peterhof, the wonderful palace of Peter the Great and his daughter Elisabeth Petrovna. It was built by Bartolomeo Francesco Rastrelli. 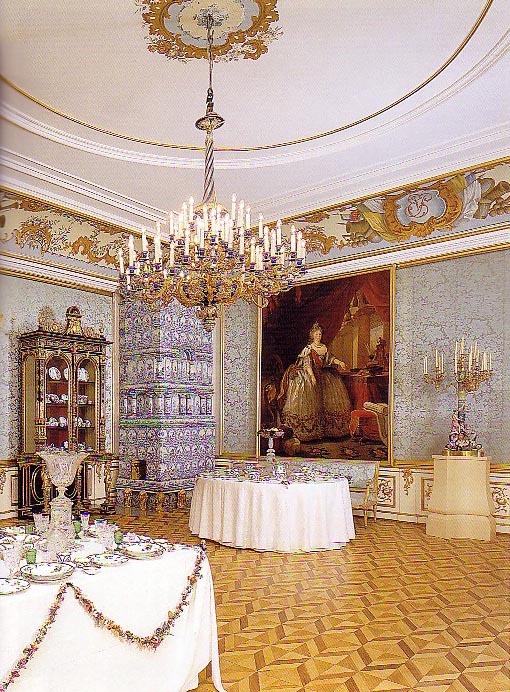 The palace was destroyed in the World War II, but now it is nearly completely restored. Rescued artefacts have been return one by one back to these wonderful rooms. 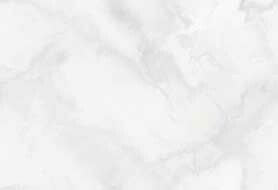 Jana sent this information and the image of the painting in the Big Blue Salon.View the other painting of Empress Maria Fedorovna on Art Page 164 which is believed to be the study for this painting. Born Princess Sophie Dorothea of Wurttemberg in Stettin (now Szczecin, Poland) on October 25, 1759 (died 1828). 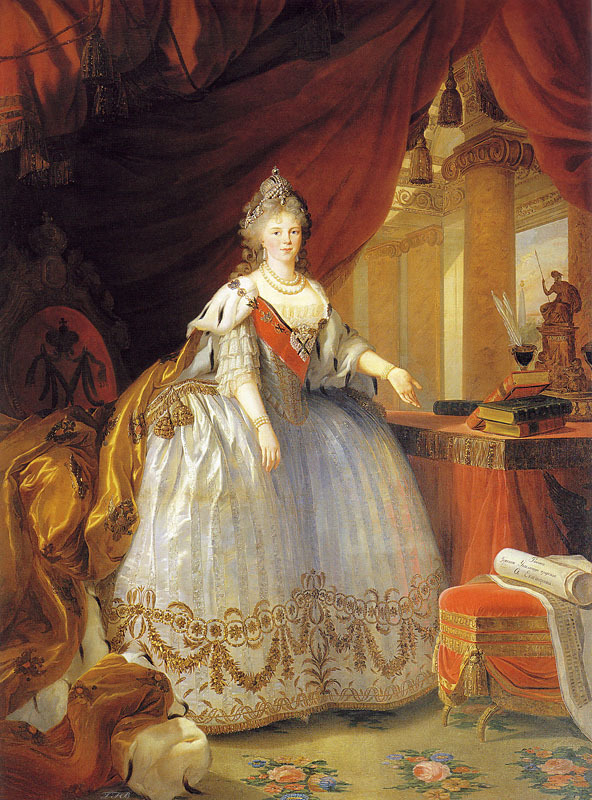 In 1773, Sophie Dorothea was among the group of German Princesses considered as possible wives of the heir to the Russian throne, the future Tsar Paul I. However, a princess of a more appropriate age was chosen instead. She died in 1776. Frederick II of Prussia then proposed Sophie as the ideal candidate to be Paul's second wife.The Russian Empress, Catherine II, was delighted with the idea.The wedding took place on September 26, 1776. Read the biography of Maria Feodorovna. According to Russian sources this is a copy of a Vigée Le Brun painting made by an unknown artist. This portrait was part of a 1990 exhibition in Germany of Russian portraits. It was originally part of the decoration of the chapel of Maltese Order in St. Petersburg. In 1941 it was moved to the State Museum of Etnography in St. Petersburg. Count Giulio (Youliy Pompeevich) Litta (1765-1839) was born in Italy. He was a son of a general of Austrian Army and his mother came from an old Italian noble family called Visconti. He became a knight of Maltese Order at the age of 17. The Grand Master of the Order sent him to Russia in 1789. So from this time on he was in Russian service. For his service in the war against Sweden he was granted the rank of a counter-admiral, and he received the order of St. George and was decorated with a golden sword of honour. In 1792 he became the ambassador of the Maltese Order in St. Petersburg and the minister of this Order. 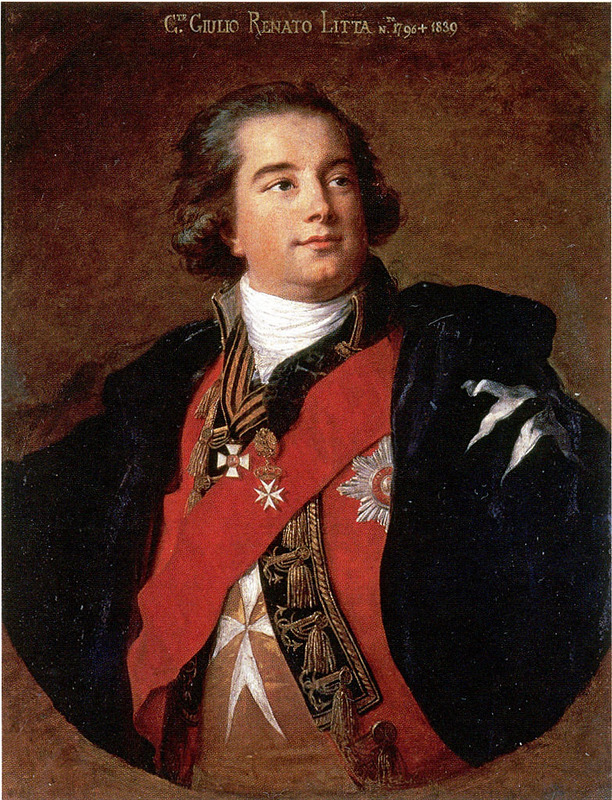 He recieved the Russian nationality in 1798 and was named a Chief of the chevallery-garde-regiment. 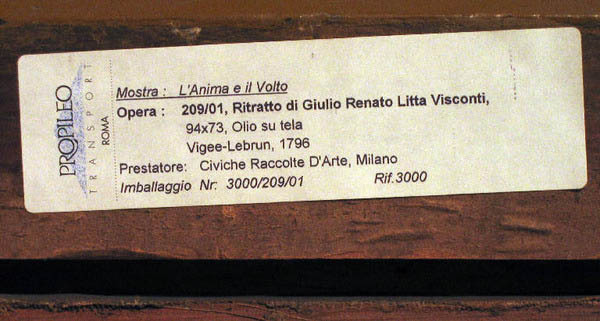 Count Giulio (Youliy Pompeevich) Litta (1765-1839) was born in Italy. He was a son of a general of Austrian Army and his mother came from an old Italian noble family called Visconti. He became a knight of Maltese Order at the age of 17. The Grand Master of the Order sent him to Russia in 1789. So from this time on he was in Russian service. For his service in the war against Sweden he was granted the rank of a counter-admiral, and he received the order of St. George and was decorated with a golden sword of honour. In 1792 he became the ambassador of the Maltese Order in St. Petersburg and the minister of this Order. 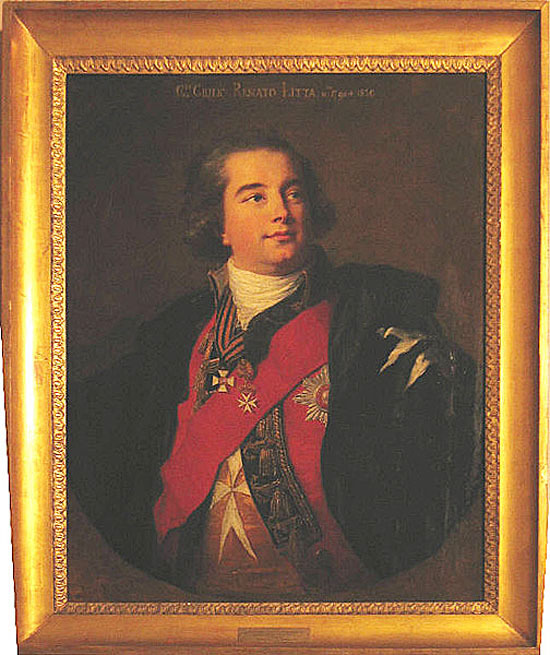 He recieved the Russian nationality in 1798 and was named a Chief of the chevallery-garde-regiment. View the ID tag on the back of this painting. View the framed painting. 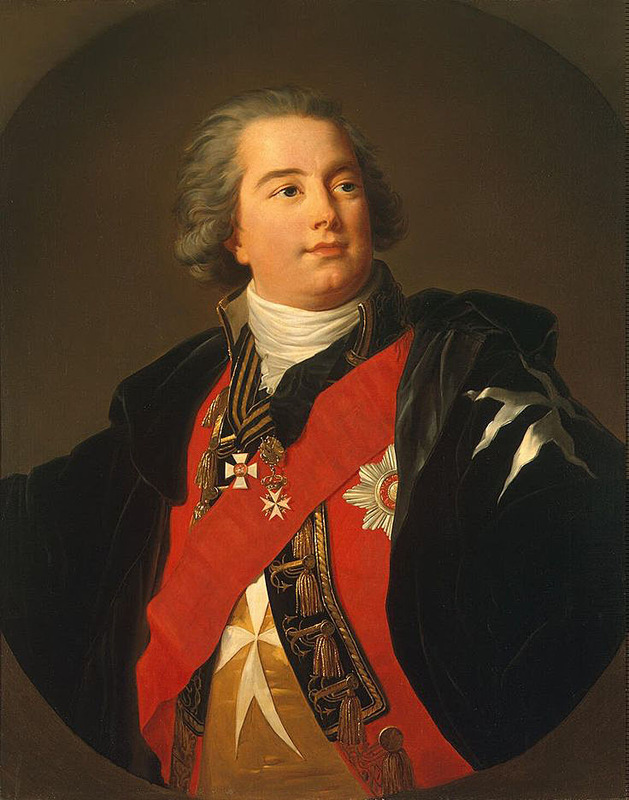 View a drawing of Count Litta by Vigée Le Brun on Art Page 34.